Originally published under the title, "A Move in an Unfinished Game." 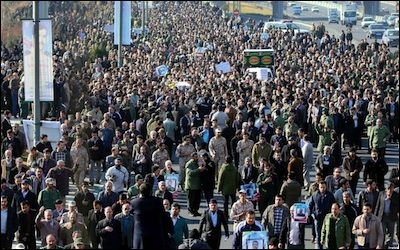 Thousands of Iranians gather in Tehran for the funeral of Revolutionary Guard Commander General Mohammad Ali Allahdadi. Firstly, the killings were a response to a clear attempt by the Iranians/Hizballah to violate the very fragile status quo that pertains between these elements and Israel in Lebanon and Syria. in his interview to the al-Mayadeen network three days before the attack, Hizballah Secretary-General Hassan Nasrallah explicitly claimed that his organization was not engaged in 'resistance work' on the Golan. The Israeli strike showed that this statement was a lie. The killings were a response to a clear attempt by the Iranians and Hizballah to violate the fragile status quo in the Golan. Some analysis of the strike has suggested that the men killed in the attack were engaged in preparation for the placing of sophisticated Iranian missile systems on the Syrian part of the Golan. Other accounts suggested that their mission was part of preparing this area for the launch of ground attacks across the border against Israeli targets, perhaps using proxies. In either case, the mission was a clear attempt to change the arrangement of forces in the north, in such a way that could be expected to ensure an Israeli response. Secondly, in the past, Hizballah has reacted differently to Israeli strikes on it or its Syrian allies within Syria, compared to strikes on Lebanese soil. The difference again relates to the unstated but clear 'rules of the game' between the organization and the Jewish state. Israeli strikes on materiel making its way to the organization from Syrian soil have elicited no response from the movement. By contrast, an Israeli attack on a weapons convoy just across the border on Lebanese soil near the village of Janta on February 24, 2014 provoked a Hizballah response . On March 18th, an IED was exploded just south of the border fence in the Majdal Shams area on the Golan Heights, wounding four IDF soldiers. The rules of the game in question do not indicate a lessening of warlike intentions or a growing affection on the part of Hizballah toward Israel. Rather, they reflect the acute need that this organization and its Iranian masters currently have to not be drawn into conflict with Israel unless this becomes unavoidable. Hizballah is overstretched at the moment. It has between 5000-10,000 men engaged in Syria. It is engaged in a determined and fraying attempt to prevent Sunni jihadi incursions across the border into Lebanon from Syria, and bomb attacks by the Sunni groups further into Lebanon. Hizballah is also an integral part of the Iranian outreach effort in Iraq, where members of the organization are engaged in training Shia fighters. The last thing that the IRGC and Hizballah need is to be drawn into a premature conflagration with Israel. Even as far afield as Yemen, where the Iran-backed Houthi militia is engaged in a push for power, the movement's fingerprints have been found. All this reflects Hizballah's nature as Iran's primary agent in the Arab world. Given all this activity, the last thing that the IRGC and Hizballah need is to be drawn into a premature conflagration with Israel. This need to avoid a collision with the Jewish state is compounded by a shortage of Iranian cash, deriving from the collapse of oil prices. The Iran/Hizballah/Assad side has long threatened to develop the Golan as a front for possible 'jihad duties' against Israel. Both Syrian President Bashar Assad and Nasrallah made unambiguous public statements in 2014 threatening the opening of military activity against Israel in this area. Israel, in turn, has made clear that such a move would constitute a violation of the status quo . The strike on Sunday constituted a very kinetic further Israeli message intended to drive home this point. Thus, despite the death of a senior IRGC commander in the Israeli strike, the action by Israel should not be seen as a general casting aside of the rules of engagement by Jerusalem on the northern border, but rather as an insistence on maintaining these rules, and a warning of the consequences to the other side of continued violation of them. The action by Israel should not be seen as casting aside the rules of engagement on the northern border, but rather as an insistence on maintaining these rules. The thing which might be held to differentiate this action from previous events is of course the death of IRGC General Mohammed Allahdadi. Allahdadi may not be the first senior IRGC figure to lose his life in Syria at Israeli hands in the last three years of war in that country. That distinction arguably belongs to Brigadier-General Hassan Shateri, assassinated on February 13, 2013, either by the Syrian rebels or by persons working for Israel, depending on which version you choose to believe. But certainly the high visibility of Allahdadi's demise, taking place unambiguously at Israeli hands, represents something new. From this point of view, the quoting by Reuters of an Israeli 'security source' to the effect that Israel did not know who was in the car at the time that it was destroyed may be seen as an attempt to re-locate the action within the realms of the recognized rules of engagement. Of course, Iran and Hizballah are strong enough to ignore such voices. but given the tense internal situation in Lebanon at present, it is likely that the lack of enthusiasm of non-Shia Lebanese for Hizballah's war in Syria, and in particular their lack of willingness to pay any price accruing from it, will factor into the Shia Islamist movement's and its master's decisionmaking. Hizballah needs a quiet and quiescent Lebanese political scene, so that it may conduct its war against Sunni jihadis coming in from Syria under the guise of unified Lebanese action, rather than sectarian account-settling. Lastly, as has been noted in previous analyses, Iran has armed and trained Hizballah so that it may be used to deter an Israeli response against Iranian nuclear facilities, or be activated as part of a response to such a strike. It is unlikely to wish to place this investment prematurely at risk. So the strike on Sunday was a re-stating by Israel of previously clarified ground rules relating to what will be permitted in Syria, and what will not. A response of some kind in the weeks, months or years ahead is likely. But the Israeli action was not a disregarding by Israel of previously existing 'rules of engagement' in the north. It is unlikely therefore to result in a similar upturning of the tables at the present moment by Iran and Hizballah.